Get tickets to Suds & Snow 2018 here! TRAVERSE CITY: Timber Ridge RV and Recreation Resort and Create TC announce the 9th Annual Suds & Snow on Saturday, March 7, 2015. Suds & Snow is where snowshoes meet microbrews, the ultimate party in the woods. The annual event will be held at Timber Ridge Resort on the back wooded trails. Tickets are on sale now at sudsandsnowtc.com. 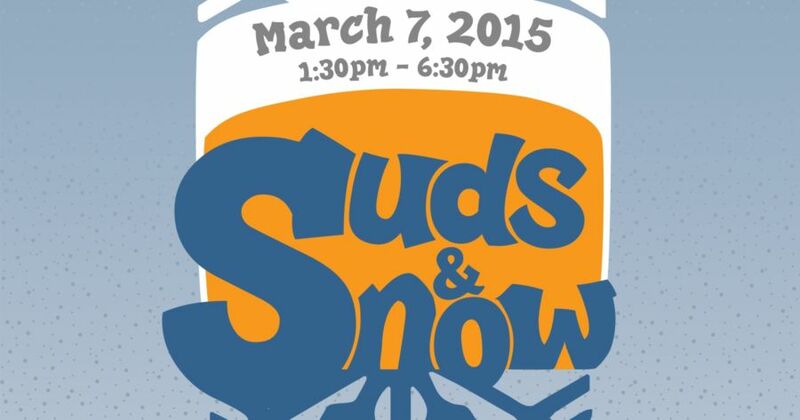 Suds & Snow will take place on Saturday, March 7th. Doors will open at 1:30 pm with live music starting shortly afterward. There will be two stages this year, with alternating sets, sponsored by Drink My Brewcast. Lucas Paul Band will be performing for the first time at Suds & Snow this year. Lucas Paul Band members are Lucas Paul (lead vocals & guitar), Pete Birchler (Lead Guitar, Vocals), Matt Henninger (Bass Guitar), Mike Shea (Drums), and Bobby Streng (Saxophone). All of these extremely talented musicians move the crowd with their originals songs and catalog of cover songs that every generation enjoys. Suds & Snow wouldn’t be complete without “Nick and J” who have performed at the event for the past five years. They have performed from Chicago to Mackinac Island for over 15 years. Consisting of members who also perform in “Old Friend” a Simon and Garfunkel tribute band, Nick and J have headlined at Cherry Festival, Cherry Ball Drop, Venetian Fesival, and The Coast Guard Festival. Get ready to move your snow shoes! We are extremely happy that “Nick and J” will be returning to Suds & Snow. Over 12 breweries will be present at the event including The Filling Station Microbrewery, Right Brain Brewery, Bravo Zulu Brewing, Jolly Pumpkin, North Peak Brewing, Beggar’s Brewery, Brewery Ferment, Brewery Vivant, Bell’s Brewery, Short’s Brewing, Founder’s Brewing Company, Blackrocks Brewery, Stormcloud Brewing Company, Schmoz and more. For those non-beer drinkers, the event will also feature Tandem Ciders and wine from Bowers Harbor Vineyards. Attendees will check in at Timber Ridge banquet hall, then enjoy a half-mile hike to the backwoods where the event will take place. This annual event is snowshoe friendly, although not required, with a fun trail on the way to the backwoods. We encourage attendees to bring their own snowshoes —or there is a limited supply for rent from Timber Ridge Resort. Please call Timber Ridge directly at 231-947-2770 to reserve snowshoes. KLT will be on-site with their Giant Red Radio. Terri Ray will host fun activities, her infamous Winter Olympics, prize wheel and more! There will be a live on-site broadcast from 1-4pm. Bay Town Kitchen will be managing all on-site food service for this year’s event. There will be three tents with different food selections including Paella, a Pig Roast and a Burger/Brat bar. All food will be purchased with event tokens. Tickets Information: Event is from 1:30pm – 6:30pm. Tickets are on sale now at sudsandsnowtc.com. Tickets will also be sold at local businesses; information can be found on the website. Tickets are $25 in advance and $35 at the door. Tickets include one drink token good for one pint equivalent. The first 500 ticket purchasers will receive a FREE Silipint glass. A limited supply of additional Silipints will also be available for purchase. Additional drink tokens will be sold for $5. $2 of each ticket sold will go to supporting local Traverse City non-profits. Cherry Tree Inn is the initial hotel sponsor and has special hotel packages that all include complimentary shuttle services to and from the event. Reserve at cherrytreeinn.com under “Specials & Packages.” Volunteer sign up is now available at sudsandsnowtc.com, lucaspaulband.com, nickandj.com. For more information about Suds & Snow, please email Troy Daily at troy@sudsandsnowtc.com or call 231.288.7676, or call Timber Ridge Resort at 231.947.2770. If you are interested in sponsorship please contact Jeremy Smith at jeremy@sudsandsnowtc.com or call 517.320.0020.